I have to say for such a little model she's been a huge challenge (not least because the inspiration for her has stopped me painting my Black Legion guys so I'm behind on my painting challenge!!). There's so much going on with this model that the detail is enough to drive a person mad. The voices think so too, they tell me so every time I think about her! I kid, I kid. The wall in the background was taken from the Garden of Morr and I used it because the roses on it matched the roses on Isabella so it created a cohesive theme throughout the model without looking forced or unnatural as you can see above. Now for the interesting bit; how I did it. There were so many techniques that went into this model that it's actually astounding to think of it. There's ink blending, wet blends, dry brushing, edge highlighting, glazes... That's just the stuff off of the top of my head and I'm pretty sure a very large chunk of my paint collection went into the finishing of this model and a huge amount of time too. Suffice to say she was not a quick job in the slightest and the easiest part to paint was the blood in the cup and even then it still took three different colours to do! 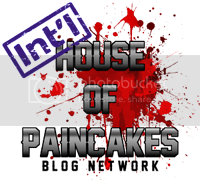 Ok so lets start shall we? Top to bottom; the hair was based with Jokaero Orange and then given a Fuegan Orange wash. I then started to highlight each individual strand of hair but it took forever and started to hurt my eyes so I switched to a small drybrush with Troll Slayer orange and then another even lighter highlight with Fire Dragon Bright and while I could have gone even lighter with the Edge paints I decided this was enough. The cape was an interesting one and for such an odd technique I think my first attempt came out quite nicely. Admittedly the wash could have been smoother but it's something I've learned for next time. The cape (and the skirt actually) started with a layer of Incubi Darkness and then washed with lots and lots of thin layers of Nuln Oil (I lost count how many actually). The ridges on the cape and the skirt were then highlighted with Kabalite Green and then Sybarite Green. After all that work and effort, I then painted over just over half of the cape with Celestra Grey in zigzags. A wash of Nihilakh Oxide came next which slightly overstepped the Celestra Grey onto the dark green layers to help facilitate a blend. Over all of this was applied numerous layers of thinned out Coelia Greenshade to blend the two sections together to (hopefully) create the image that she is materialising from spirit energy (as though Nagash has only just finished bringing her back).I'm not sure the effect is as grand as I was hoping as the cape is really small so it didn't give me much room to work with and as I tried to even out the Coelia Greenshade I ended up creating the opposite effect so it does look a little on the streaky side. Now the gold. The gold I loved painting and I slightly diverted from how I plan to paint Nagash here as I chose to base all of the gold areas in Screaming Bell and I'm so glad I did as it has created a much warmer gold colour than Balthasar Gold usually does though I was worried initially that I'd made the wrong choice as it didn't stand out very much from the orange of her hair because of the reddish hue of Screaming Bell. I continued anyway by washing it all with Seraphim Sepia (again a slightly more red and warmer wash than Agrax Earthshade) before layering up with Gehenna's and Auric Armour Golds. The shoulder pads didn't exactly turn out as I'd planned and I think I've figured out why (I love them all the same). Her skin and the shoulder pads were based with Rakarth Flesh, then they were given washes of thinned down Agrax Earthshade. The shoulder pads got more coats of the shade to make them darker and then given an edge highlight with Rakarth Flesh. I think the reason they didn't turn out like they did in the GW painting tutorial for Nagash (the basis for a lot of this model) is that the shoulder pad they do it for on Nagash has a lot of large flat surfaces whereas these pads are ridged but I like the effect anyway. Carrying on with her skin, I then gave it all a highlight of Rakarth Flesh before applying a few coats of thinned down Athonian Camoshade. I then highlighted again with Rakarth Flesh and I was planning to add a few highlights of Pallid Wych Flesh but once I got to that point I realised I liked the skin as it was. It's darker than I'd normally paint skin and looks unnatural so I kept it. 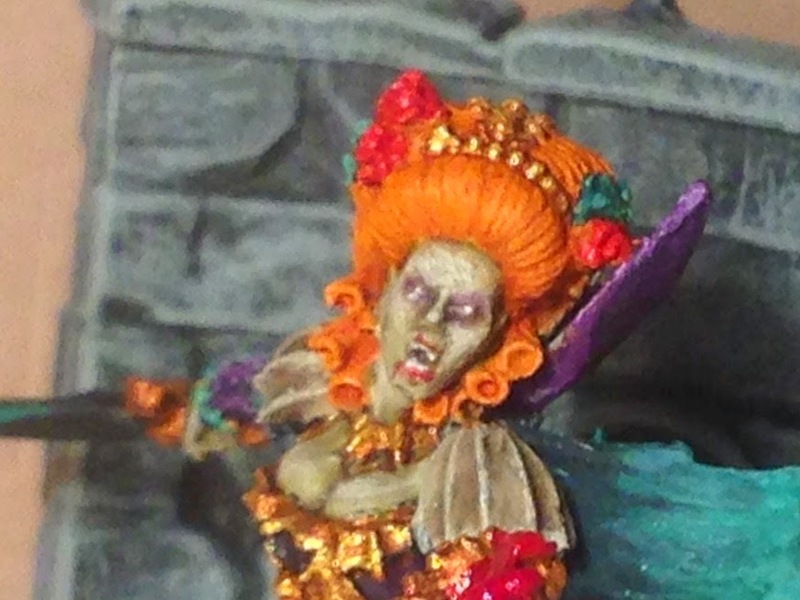 For her eye make up I applied a few layers of really thin Druchii Violet and the notted the eye with Pallid Wych Flesh. I like that it's off white which lends to the gaunt appearance that I was aiming for. I didn't dot the pupils as again it makes her look creepy and unnatural (even for a vampire queen). The armour was actually one of my favourite parts of this model to paint and was quite simple; Naggaroth Night, Xerus Purple and Genestealer Purple. Still took a long time to get all the highlights just right and with the collar there was a slight war between the orange and purple paints over who got to be on the inside of the collar which almost led to her not wearing one but I perservered and eventually purple got the collar and orange stayed on the head. Her sword was painted black and then given an edge highlight of Kabalite Green, then Sybarite Green, then a wash of Coelia Greenshade, then Waywatcher Green (both thinned down) and then a fine highlight of Sybarite Green and White Scar was applied. Sounds simple but I kept getting shaky hands so I had to clean up the highlights a lot. That wasn't so fun. The lace was simply layered with thinned down Pallid Wych Flesh, then successive thin layers of Coelia Greenshade. I didn't want to go too crazy with the lace as it had the potential to completely dominate the whole model which I didn't want (believe me, I've seen some images where the only thing you really look at is the lace. I didn't want that for my Izzy). The skulls in the wall were painted in my usual way (Zandri Dust, Agrax Earthshade, Ushabti Bone and Screaming Skull) and the wall itself was simply successive drybrushing of the greys from Eshin Grey up to Dawnstone. when I'd finished the wall it looked like something out of a black and white horror movie which was cool but I'm not good with grey-scale otherwise it would have been a pretty cool idea to have a fully "black and white" army. I've seen a picture of a Necromancer done like it and it looked amazing. I'm just not good enough to be able to do it (not being self pitying here, I just know that it takes a lot of skill to convert colour to greys and have it look good which I don't know how to do yet). The roses on the wall and on Isabella were based with Khorne Red, washed with Carroburg Crimson and highlighted with Evil Sunz Scarlet. The leaves on the wall were simply Caliban Green and Kabalite Green but on her dress I had to add another highlight of Sybarite Green as they just blended right in and they were indistinguishable from the rest of the highlights. finally (well actually it was one of the first things I did) the base was sanded and then painted with Dryad Bark, then drybrushed with Gorthor and Baneblade Brown then given a coat of 'Ardcoat so that it looks like wet dirt. Of course I forgot that the effect would be lost with Matt Varnish and so I have to regloss the mud and the blood (which was the same as the roses except I added Blood for the Blood God over it). So there we have it, the beginnings of my Undead army. 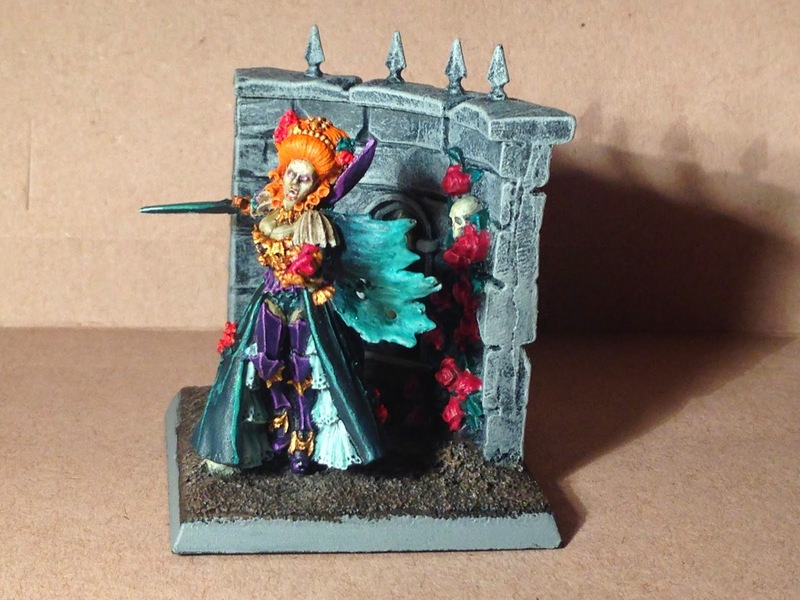 I finished the Necromancer today too but I'd like to do him justice by giving him his own article as there's a lot going on with him too. Plus I've just noticed that I forgot to do the cover of his book so I haven't finished him at all... Damn. Next time you see the Necromancer though he'll be finished. Promise. That was so thoughtful, sweetie! Love the scenic base. Just love it.